Almost everywhere I go wandering now, right around sunset, I start to hear their calls. It is an unmistakable sound – a loud, short, ascending, piercing/shrieking “what the hell is that?” call that cuts through the falling night and thick air – a whining, desperate, yet strong sound – definitely recognizable to even the untrained ear as the sound of a begging youngster. The young great-horned owls are now out of their nests and flying around, but still dependent on their parents for the bulk of their food. And they don’t let them forget it. Sunday night, I took a wander at sunset to see the last light of day before the arrival of the so-called “super moon.” Most media sources have exaggerated the size of the moon on these occasions – regardless, it is certainly slightly brighter and bigger during these times when the full moon and perigee coincide (perigee is when the moon is closest to the earth during its elliptical orbit around us). 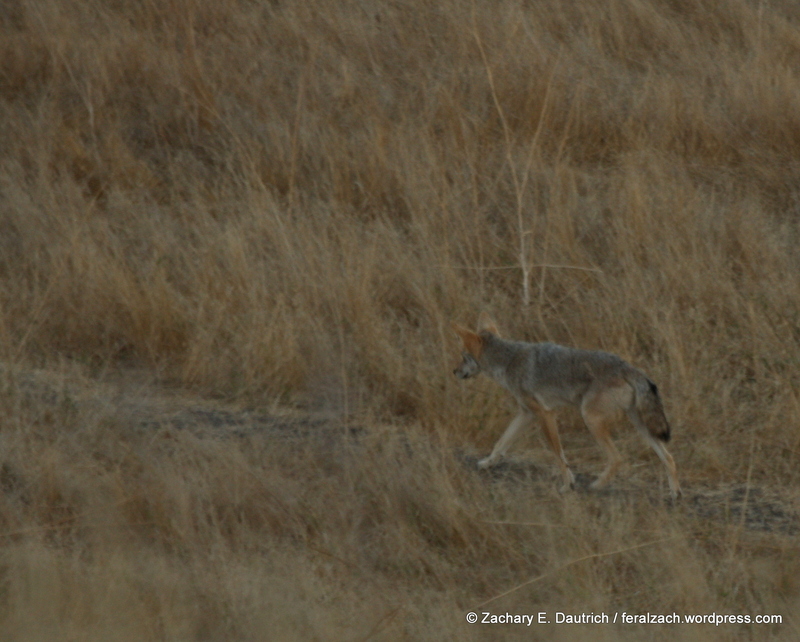 I followed it, and we stayed on the same path for at least a mile until a second coyote came into view. The moon was not yet visible from behind the low-hanging clouds to the east, but this valley was already alive with the creatures of the night. 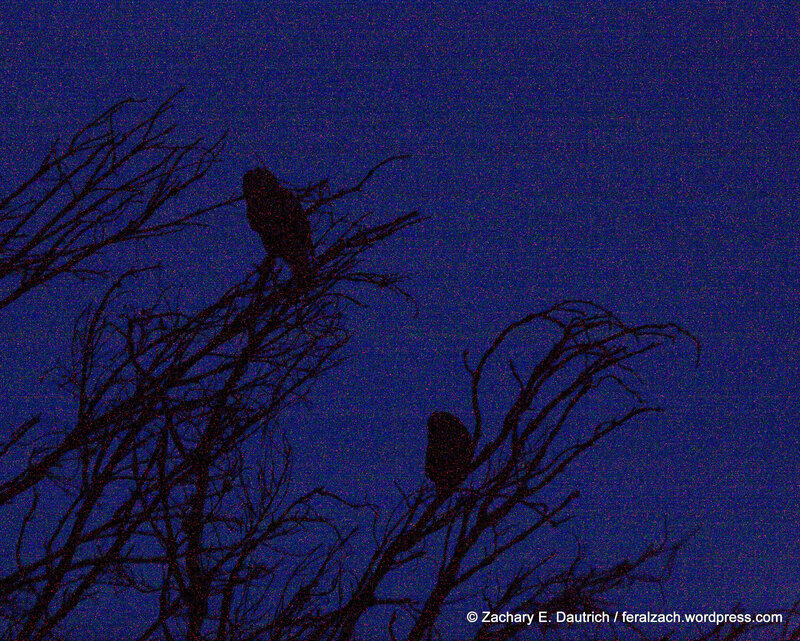 As the coyotes darted around in the open field marking their territory and investigating the ground squirrel holes, the baby owls had started their begging calls in the treeline to the south. By ear, it sounded like three of these young ones. 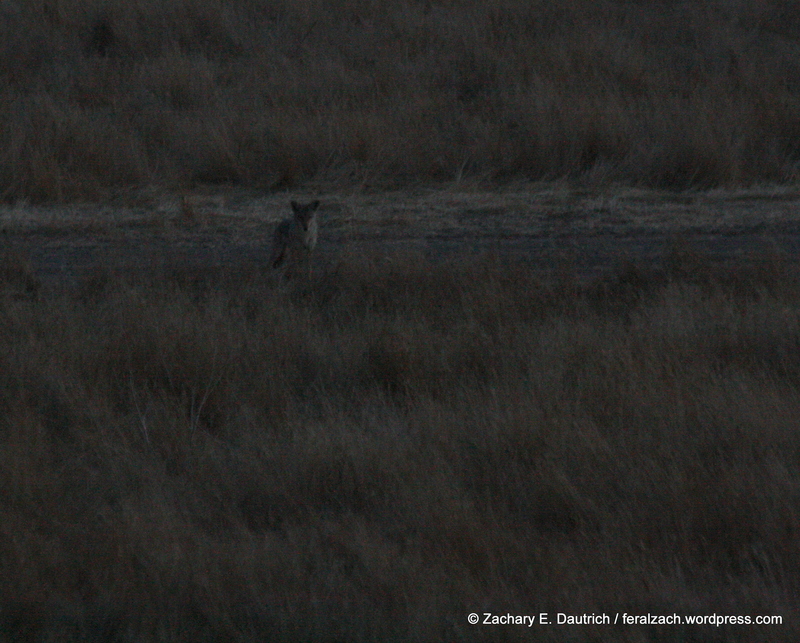 I watched one coyote mark an area up the side of the valley, then disappear over the ridge. It’s mate walked over to the area that had seemed to captivate the male, then disappeared in the other direction. Of course I went to see what they had been checking out. Just as I reached that area up the hillside opposite the sound of the young owls, the female coyote that had just been there re-appeared back on the trail where I had just been – she had looped around and was now watching me. In this light (or lack thereof), it takes a careful eye to see them even when they’re moving, their camouflage is so amazing. As I looked at the area they had been checking out, she checked out the area that I had just been. Our gazes met briefly as we acknowledged one another and then returned to what was before us. She backtracked where I and the first coyote had come from, until finally cutting up a ravine in the general direction that her mate had gone. There were three young ones, and the two adults were there in the general area as well, hooting amid the youngsters’ begging. Five owls making a lot of noise. In addition to the hooting, the adults made some other sounds – ones that they seem to use when greeting each other at the beginning of the night when they reunite from their daytime roosts. It’s an intimate and endearing sound, almost a cooing noise mixed with a cluck. I watched for about ten minutes until they finally dispersed into the night – likely the young ones followed the adults as they set out to hunt, making their job of getting food that much more difficult! It was just about then that the moon rose above the clouds – what a sight indeed. The air was still and warm, and with the sudden light of the moon the entire valley lit up with a blue light that illuminated everything. As I wandered slowly back towards my vehicle, a buck and a skunk escorted me out. Then it started begging, right at me! It’s mouth opened so wide, it looked like I could peer directly down into its belly! And the sound! It was incredibly loud, coming right in my direction. I didn’t move. Finally it swiveled its head around to face the valley before us, in the direction of its two siblings, and continued to cry – occasionally looking around and back at me, spreading its cries in every direction in hopes of a meal soon. We spent a few minutes together, and it was only the approach of an oblivious hiker who came within about 100 yards that ushered it to take flight. This entry was posted on August 13, 2014 by feralzach. It was filed under Uncategorized and was tagged with Bubo virginianus, coyote, great-horned owl, juvenile.